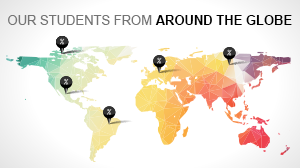 Read what our families and alumni are saying about TMI! 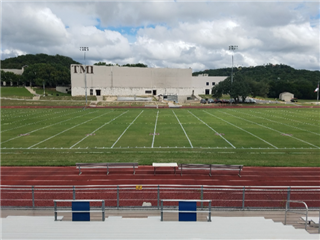 Take a virtual tour of our campus, from classrooms to athletic facilities, and see what TMI has to offer. Registration is now open for Summer At TMI camps, sports, activities, and academic classes (click here). 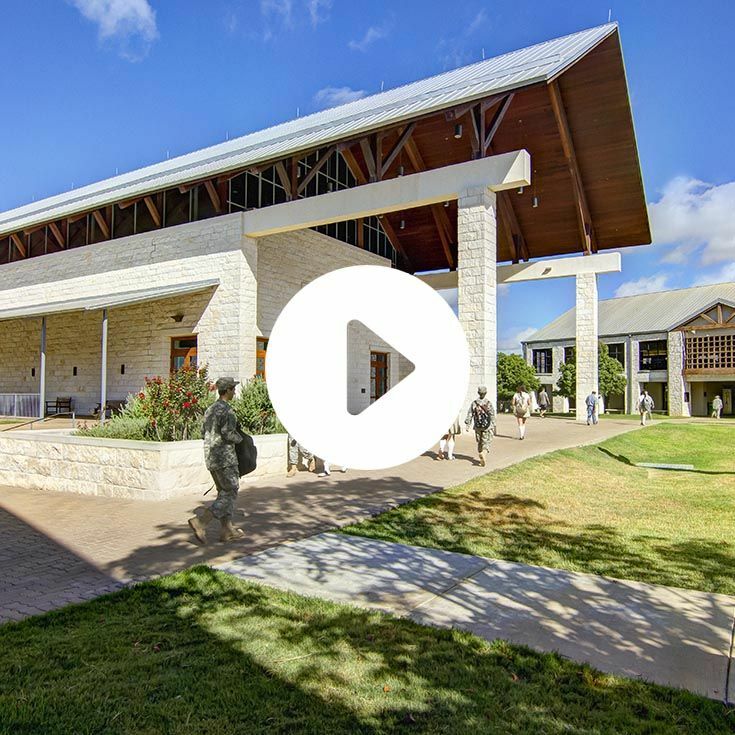 Located in the Texas Hill Country, just 20 miles from downtown San Antonio, TMI Episcopal is a coed, college-preparatory school for students in grades 6-12. Its rich history dates back to 1893 when the school was founded by the Episcopal Diocese of West Texas and has grown to become the excellent academic community it is today. 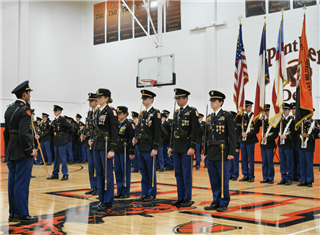 From honors and Advanced Placement courses, a wide range of fine art and athletic activities, and the optional, distinguished JROTC program to the school’s dedication to service and leadership, TMI is a place for students to engage, learn, and grow into the well-rounded leaders of tomorrow. At TMI Episcopal, we know you want to be confident about your child’s private middle school and private high school education. We understand you need a community of dedicated faculty, passionate leadership, and opportunities for your child to serve, lead, and grow. Join us in preparing your child for the future by letting TMI build the foundation to succeed in college and life. When entering our middle school, your child will be a part of our community from day one. Every incoming sixth grade student is partnered with a high school senior, who serves as a mentor and guide throughout the year, as part of our Panther Pals program. 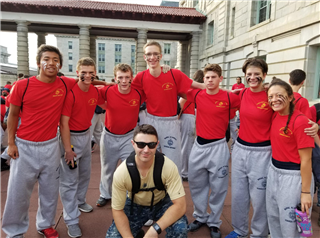 As students advance through the grades, structured programs such as Cadet Tutoring and Peer Mentors provide unique opportunities for peer-to-peer assistance and guidance. 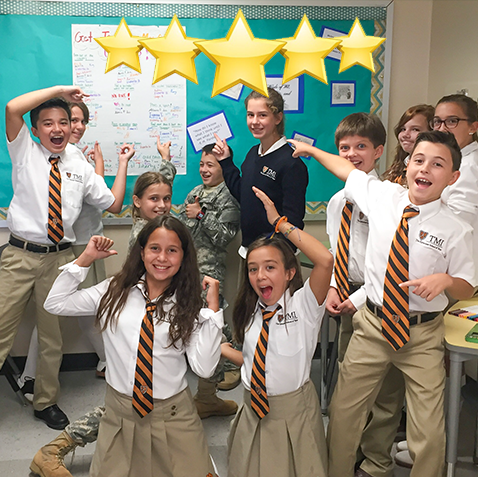 Our dual accreditation by the Independent Schools Association of the Southwest and the Southwestern Association of Episcopal Schools, combined with our 124 years of experience, allows us to create an exceptional educational community. 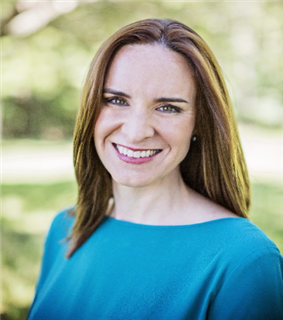 Get started on your Panther journey and let your child continue the legacy of countless TMI alumni including: General Douglas MacArthur; Tom C. Frost, Jr.; Congressman Lamar Smith; and New York Times Bestselling Author Sophie Jordan. Call today to discover the TMI difference by setting up a Shadow Day for your child or attending our next Admissions Open House for both middle school and high school students and families. 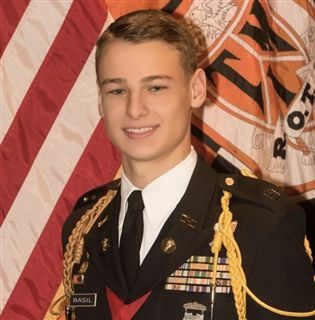 TMI Episcopal sophomore Jackson “Jack” Basil was selected as one of 15 Texas delegates to attend the Texas Youth Education Summit (YES), held Feb. 28-March 3 in Austin. 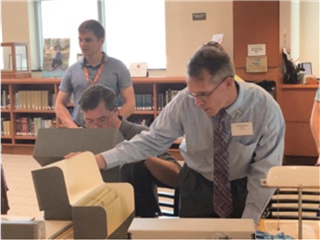 The event teaches high-school students more about their state governments and the roles their generation of voters will play. 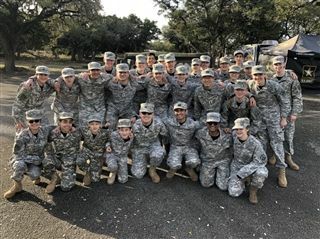 Cadets from TMI Episcopal’s Texas Military Institute Corps of Cadets (Army JROTC) earned top places at the St. Mary’s University Orienteering Meet, held Feb. 23 at Camp Bullis. 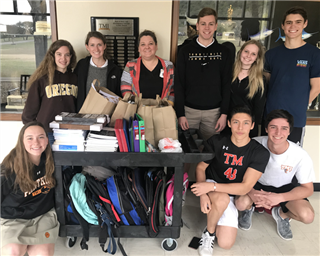 TMI Episcopal students collected school supplies to donate to the Battered Women’s and Children’s Center in San Antonio. 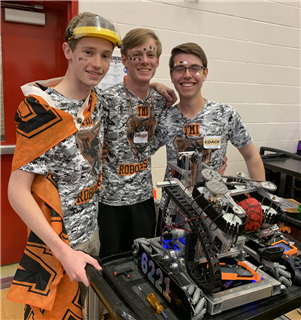 Robotics Team 6221 from TMI Episcopal and their robot Pantherbots Alpha qualified to advance to FTC (FIRST Tech Challenge) state competition after competing at the FTC Regional Championship, held March 2 at Canyon High School in New Braunfels. 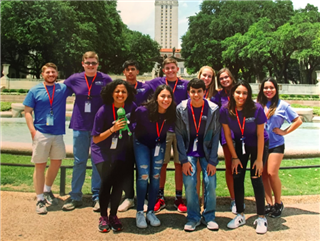 Sixty-six schools were represented from Austin, Corpus Christi, Houston, San Antonio and surrounding areas, including teams sponsored by NASA and Toyota. 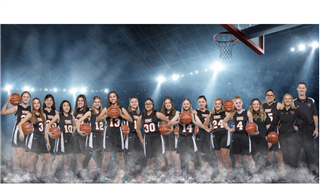 Members of the TMI Episcopal women’s varsity basketball team were named to TAPPS (Texas Association of Private and Parochial Schools) All District honor teams. 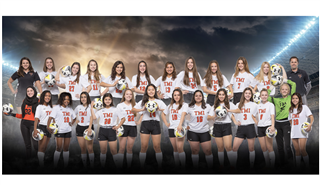 Members of TMI Episcopal’s varsity soccer teams earned TAPPS (Texas Association of Private and Parochial Schools) District II and state honors. 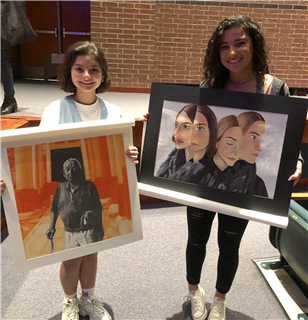 Two TMI Episcopal students participated in the regional VASE (Visual Arts Scholastic Event), held Feb. 23 and John Paul Stevens High School, a juried art show for high-school students sponsored by the Texas Art Education Association. 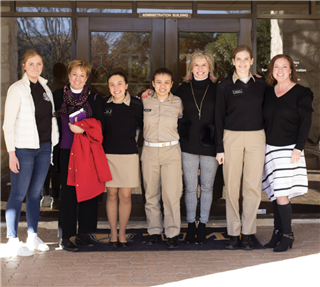 On Saturday, February 23, 2019, 20 middle school students and 11 upper school students were accompanied by Latin teachers, Claudia Clark and Alleyne Rogers, along with parent volunteer, Kristin Jackson, as they attended the 2019 Texas State Junior Classical League (TSJCL) Area B Convention at Clark High School. 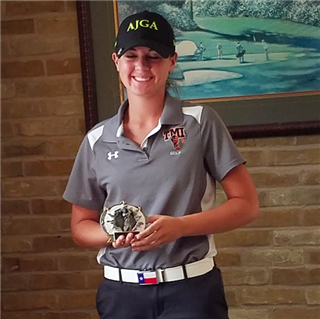 TMI Episcopal junior Delaney Martin won the Taft Classic Golf Tournament on Feb. 25 at Fair Oaks Ranch Country Club. She scored an 8 under par 64 to win the tournament by over 10 strokes and birdied half of the 18 holes on the course. 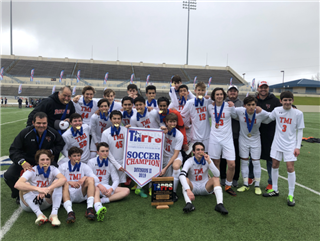 The TMI Episcopal boys varsity soccer team won the 2019 TAPPS Division II Boys Winter Soccer State championship game Feb. 22 at Waco ISD Stadium in Waco. The Panthers defeated Prince of Peace Christian School of Carrolton 3-2 in an exciting game, trading goals with the Eagles. 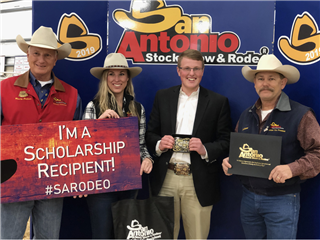 TMI Episcopal senior Trent Wisian won two awards Feb. 18 at the San Antonio Livestock Show and Rodeo. 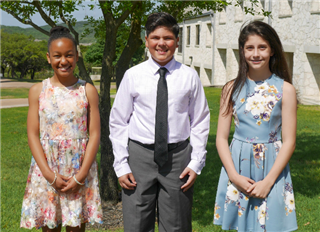 Four TMI Episcopal freshman were inducted into the National Hispanic Institute (NIH) on Feb. 16 in the International Conference Center of the University of the Incarnate Word. 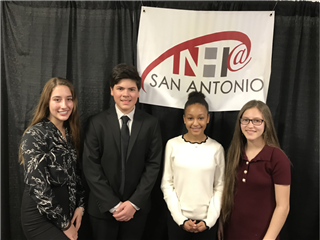 Reagan Davis, Kailey Kessler, Jake Kilbride and Anaya Zachery were chosen along with about 80 other students representing 24 high schools in the San Antonio area. 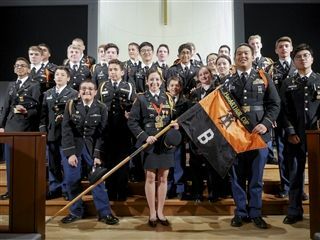 For the 25th year in a row, TMI Episcopal’s Texas Military Institute Corps of Cadets has earned the title of Honor Unit with Distinction, the highest rating an Army JROTC unit can receive. The Texas Military Institute Corps of Cadets, optional military program of TMI Episcopal, honored its senior cadets at its annual Military Ball, held Feb. 2 at the Hyatt Regency Hill Country Resort. 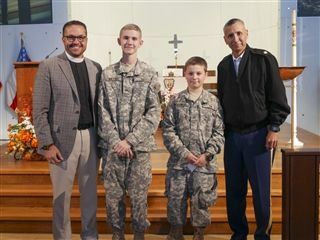 More than 600 cadets, their dates and parents attended. 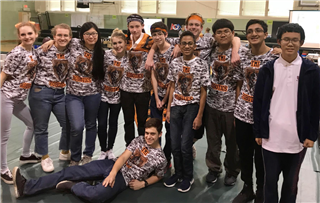 TMI Episcopal’s Robotics Team and their robot 6221, “Pantherbots Alpha,” were part of a two-team winning alliance at the Alamo Area FTC (FIRST Tech Challenge) league championship held Feb. 2 at Brandeis High School. 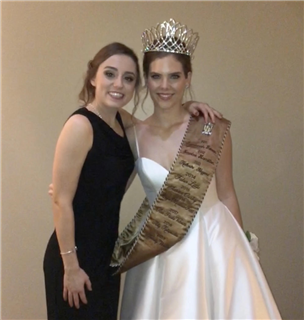 A panel of judges representing women of achievement in the church, business and the nonprofit sector met Jan. 26 at TMI Episcopal to judge this year’s candidates for Military Ball Queen. 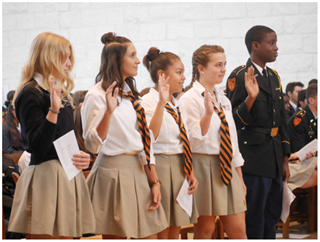 Eligible students are senior female members of the school’s Corps of Cadets (JROTC); they are judged on bearing, presentation, poise, professionalism and record of activities and leadership within the Corps. 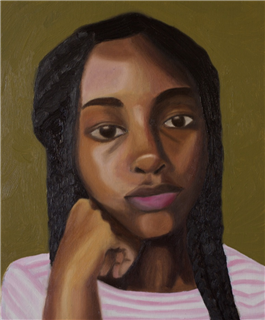 Thirteen Upper School students from TMI Episcopal won a total of 25 awards in the 2019 San Antonio Scholastic Art Awards, including five top Gold Key awards and several students with multiple awards across categories. 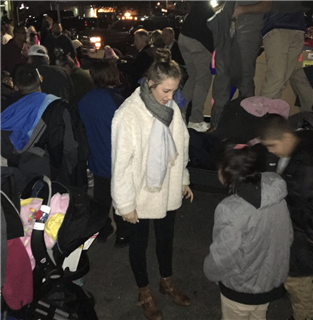 With the help of several area businesses, TMI Episcopal senior Hannah Allen brought some seasonal warmth to homeless men, women and children visiting Haven for Hope last month. 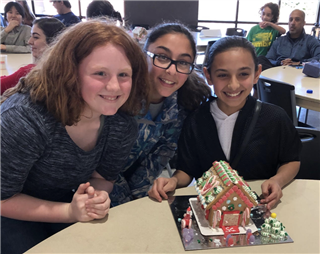 TMI NHS hosted a school-wide gingerbread house decorating contest on Saturday, December 15! The event raised money for the Christmas Spirit Foundation's Trees for Troops charity, an organization that sends Christmas trees to troops overseas and to military families stationed around the United States. 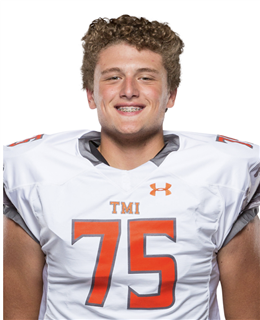 TMI Episcopal junior Evan Stanford has been selected to play in two bowl games showcasing top talent in high-school football. 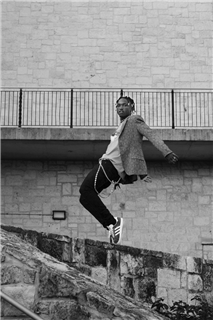 TMI Episcopal junior Hannah Lashway and Fine Arts teacher Hannah Cooper-McCauley both won awards in the 2018 ATPI (Association of Texas Photography Instructors) Fall Photography contest. 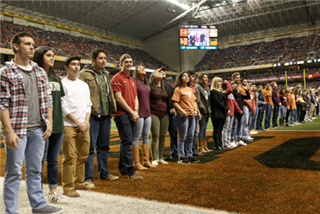 Their work was chosen for recognition from among 7,400 entries from 99 schools across Texas, plus California, Kansas, Oklahoma and Washington state. 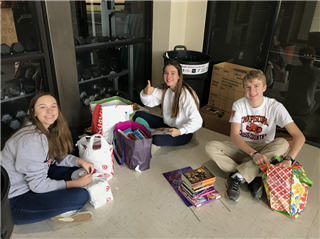 Members of the TMI Episcopal chapter of the National Honor Society (NHS) collected more than 1,000 books to donate to SAReads, a project of Literacy San Antonio that operates a Book Bank to supplement area classroom libraries. 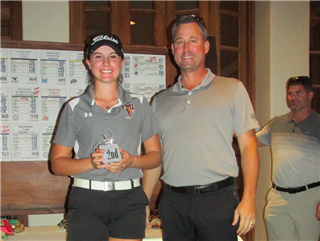 TMI Episcopal junior Delaney Martin placed first in two golf tournaments within three days. 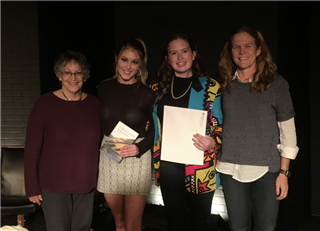 TMI Episcopal junior Meredith Ervin won first place in the school’s seventh annual Poetry Out Loud recitation contest, held Nov. 26 in TMI’s Margaret Alkek Theater. Ervin received a copy of “So Far So Good: Poems 2014-2018,” by Ursula K. Le Guin, and will represent TMI in the Texas state competition. 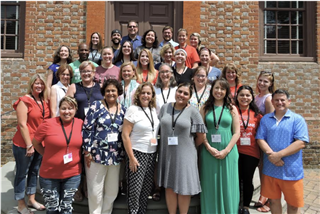 Jill Cross, dean of curriculum and instruction at TMI Episcopal, served as a master teacher at the Colonial Williamsburg Teacher Institute, a program of summer sessions that demonstrate an interdisciplinary approach to teaching social studies. 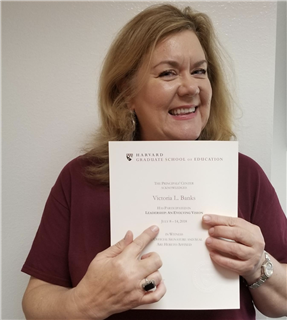 Victoria Banks, TMI Episcopal Head of Middle School, earned a graduate certificate earlier this summer at a Harvard University program for professional educators. 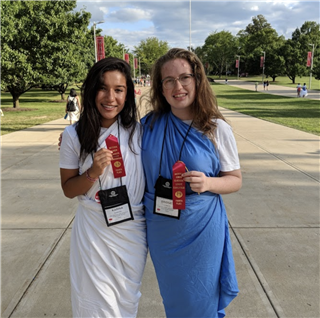 Bridget Lynch and Karina Samuel, both rising seniors at TMI Episcopal, brought home top-place awards from the National Junior Classical League convention, held July 22-28 at Miami University in Oxford, Ohio. 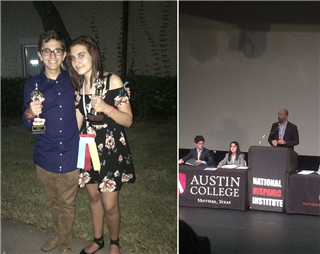 Rachel Davis, a rising sophomore at TMI Episcopal, excelled at the Texas Great Debate, sponsored by the National Hispanic Institute and held June 7-10 at Austin College in Sherman. 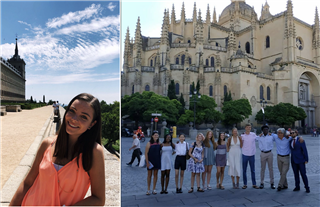 Claire Williams, a rising sophomore at TMI Episcopal, recently completed a monthlong summer Spanish immersion program for high-school students in Segovia, Spain. TMI Episcopal history teacher Kristian Marks joined colleagues from all over the country at a workshop on Technology’s Impact in American History, held June 27-29 at the U.S. Army History and Education Center in Carlisle, Pa.
Anne “Annie” Notzon and Trinity Walker, both rising seniors at TMI Episcopal, represented their school as delegates to Bluebonnet Girls State , held June 17-23 at Texas Lutheran University, with a Capitol Day visit to Austin. 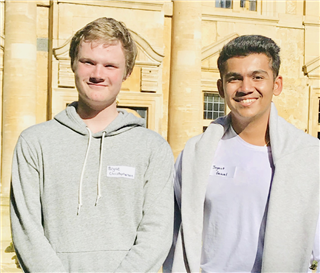 Bryce Christopherson, a rising junior at TMI Episcopal, attended the Oxford Summer Academy at Oxford University in Oxford, England. 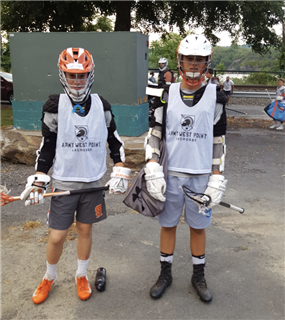 Alex Belucci and Ethan Lakhia, rising freshman at TMI Episcopal, attended the Army West Point Lacrosse Camp, held July 10-13 at the U.S. Military Academy. 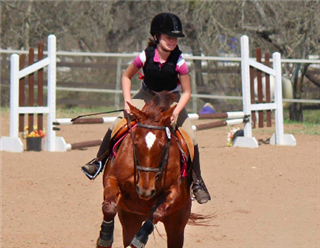 Adelaide “Addy” Toll, a rising seventh grader at TMI Episcopal, successfully passed her D-3 rating examination for the United States Pony Club (USPC) on June 16 at Pine Hill Equestrian Center in Bellville. Hannah Growney, a rising freshman at TMI Episcopal, successfully completed Auburn Vet Camp, held June 17-22 at the Auburn University College of Veterinary Medicine in Auburn, Ala.
Simon Bruhn and Claire Hughes, both rising juniors at TMI Episcopal, represented their school at the Texas – Capital Area Hugh O’Brian Youth Leadership (HOBY) seminar, held June 8-10 on campus at the University of Texas at Austin. 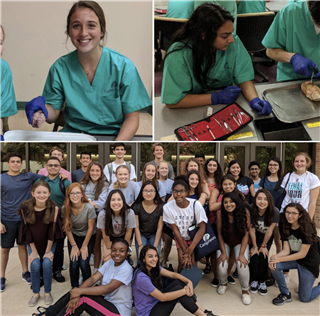 Hannah Allen and Manaal Salman, both rising seniors at TMI Episcopal, attended Camp Neuro, held June 25-29 at the University of Texas Health Science Center at San Antonio. 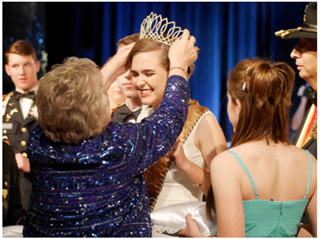 TMI Episcopal’s annual gala netted $165,250 to benefit TMI student programs. 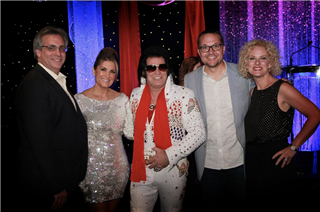 More than 350 guests attended Stars 2018: Welcome to Fabulous Las Vegas, held April 7 at the Venues at Valero. 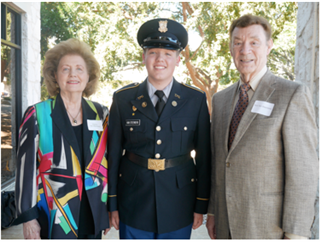 Jessica Cox, a rising senior at TMI Episcopal, completed the U.S. Naval Academy (USNA) Summer Seminar, held June 9-14 on campus in Annapolis, Md. 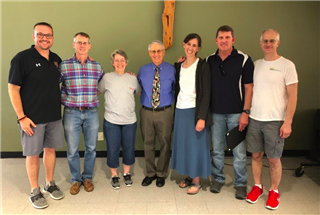 Five TMI Episcopal teachers were presented with the first-ever Bob Bell Core Values Awards at the end-of-year Headmaster’s Luncheon, held May 25 in the school’s Alkek Refectory. 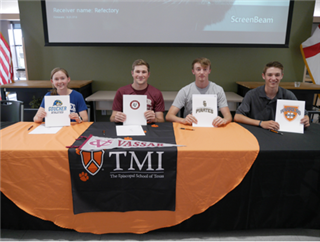 Six TMI Episcopal seniors committed to college athletics during a signing ceremony, held May 17 in the school’s Alkek Refectory. The graduating Panthers will play a variety of sports at schools across divisions of the National Collegiate Athletics Association (NCAA). 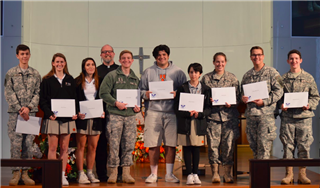 Congratulations to the Foreign Language and Cadet Challenge Award winners who were honored in chapel on Wednesday, May 9, 2018. Congratulations to the end-of-year Cadet award recipients who were recognized at the May 4, 2018, Pass in Review ceremony. The Reviewing Official was CPT Trent Melcher, Active Duty Air Force Pilot and TMI graduate of 2007. Congratulations to the award recipients of the 2017-2018 Upper School Academic Awards for juniors and seniors. 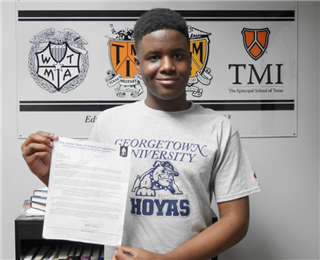 Aaron Mills, a freshman at TMI Episcopal, has been accepted to the JSA summer program for high-school students at Georgetown University in Washington D.C., where he will study AP (Advanced Placement) Comparative Government. The Rev. Scott J. 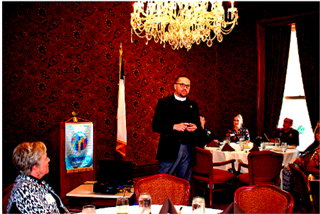 Brown, headmaster of TMI Episcopal, was the guest speaker at a meeting of the Fair Oaks Ranch Rotary Club, held April 25 in the Fair Oaks Ranch Country Club. On Wednesday, April 25, 2018, the Class of 2019 was sworn in to their new non-commissioned and commissioned officer ranks. 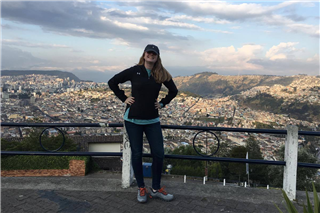 JuliaGrace Walker, who graduated last year from TMI Episcopal, returned April 26 for a daylong series of talks to Upper School Spanish classes about her experiences in Ecuador with a gap-year program, Global Citizen Year. 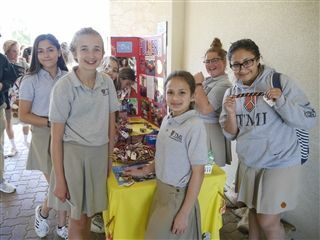 The Middle School Spanish Club of TMI Episcopal raised $1,280 for the Pulsera Project, a nonprofit organization that partners with U.S. schools to sell colorful bracelets (pulseras in Spanish), handwoven by artisans in Guatemala and Nicaragua. 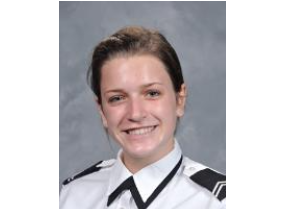 TMI Episcopal sophomore Mary Warder has been selected to attend the FBI Future Agents in Training Academy, to be held June 18-22 in Cleveland, Ohio. 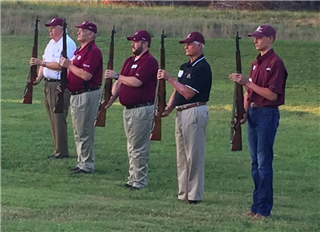 TMI freshman Jackson Basil of Boerne participated in the Hill Country A&M Club’s Aggie Muster, held April 21 at the Burdick Community Center in Boerne. 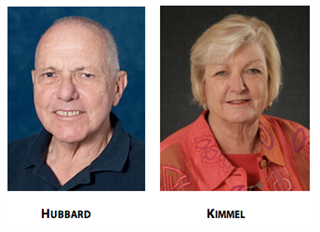 TMI Episcopal announces new members of the school’s Board of Governors and Board of Trustees, appointed by the Rt. Rev. David M. Reed, bishop of the Episcopal Diocese of West Texas. 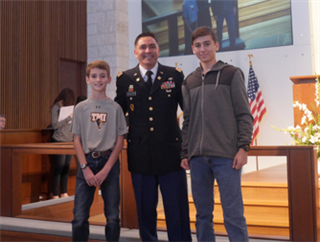 TMI Episcopal has announced spring Cadet of the Semester awards for two members of the Texas Military Institute Corps of Cadets, the school’s JROTC program. 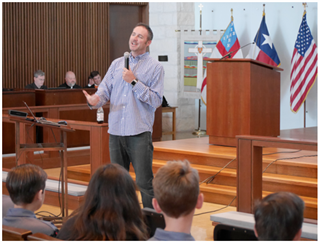 Two new recipients of the Albert B. and Margaret M. Alkek Scholarships and a new Frost Scholar were introduced to the students and faculty of TMI Episcopal on April 17 during daily chapel. 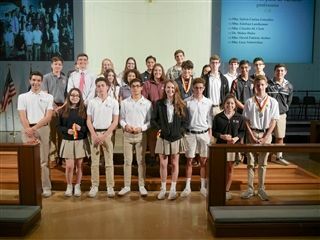 TMI Episcopal’s Mario Rivela Chapter of the Sociedad Honoraria Hispanica (Spanish Honor Society) inducted 26 new members in a ceremony held April 19 in the school’s All Saints Chapel. 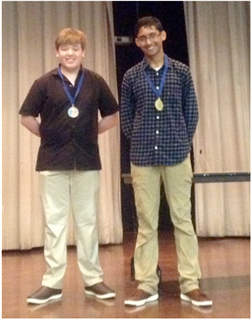 Latin students from TMI Episcopal brought home honors in many categories from the Texas State Junior Classical League (JCL) convention, held April 13-15 at Naaman Forest High School in Garland. 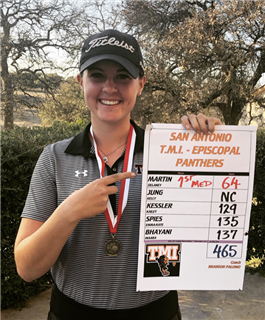 TMI Episcopal sophomore Delaney Martin finished first with a score of 82 in the District 3, Class 5A Tournament on April 16 at the Golf Club of Texas. 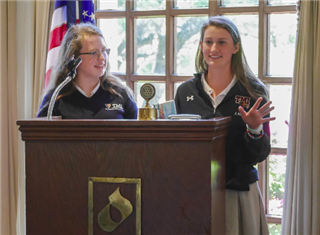 TMI Episcopal juniors Bridget Lynch and Annie Notzon spoke to the April 10 meeting of the Dominion Rotary Club about their experiences at the Rotary Youth Leadership Awards Conference (RYLA), held Jan. 12-15 at the John Newcombe Tennis Ranch in New Braunfels. The Dominion Rotary Club sponsors two students from TMI every year to attend RYLA. 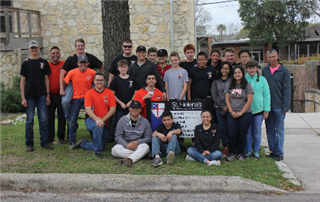 Members of the TMI Corps of Cadets took some time to give back at St. Helena’s Episcopal Church in Boerne in March. 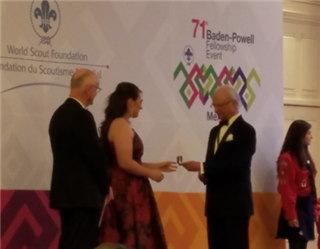 TMI Episcopal senior Ella Hirsch was honored as a Baden-Powell Fellow and World Leader of Tomorrow at the annual Baden-Powell Fellowship Event of the World Scout Foundation, held March 23 in Mexico City. 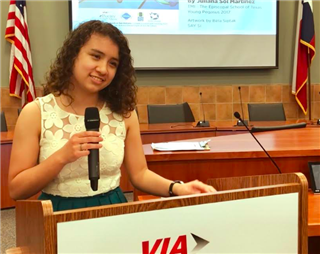 Congratulations to junior Juliana Martinez for having her poem selected by Via Metropolitan Transit to be displayed on an interior card on a via bus as part of the Via 2018 Poetry On The Move program. 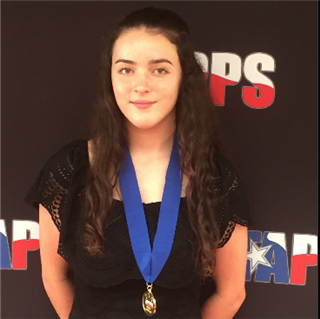 Jordan Bell, a junior at TMI Episcopal, earned a Superior rating and a gold medal at the TAPPS String Championships, held March 28 at St. Mary’s University. 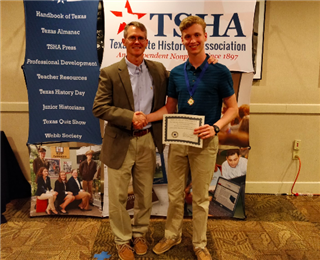 Brandon Rubsamen, a junior at TMI Episcopal, was awarded first place in the Senior Division for the Kate Harding Bates Parker Award in History from the Texas State Historical Association (TSHA)/Junior Historians of Texas. 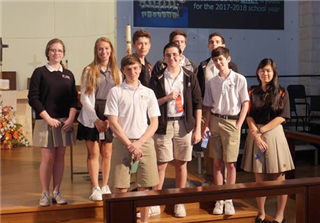 Congratulations to the following students who were recognized in chapel last week, April 3, as becoming members of the Freshman Scholastic Society. Students must have a 90 or higher GPA for the 1st semester to be included in the society. 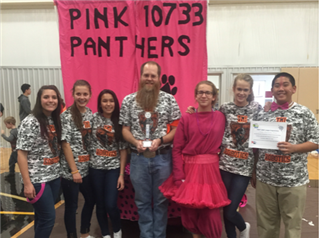 Congratulations to the TMI Pink Panthers robotics team! 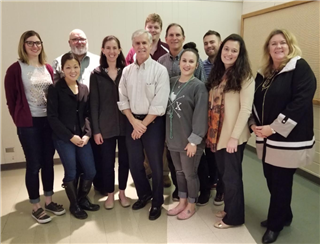 On February 22, 2018, 10 TMI teachers joined Jay McTighe, curriculum and assessment expert, for a 2-day professional development session on Performance Based Assessment. 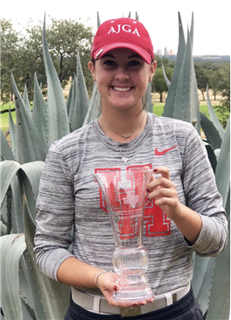 Congratulations to sophomore Delaney Martin on winning the Taft Classic by four strokes on Monday, February 26; this is her third victory for TMI this season! 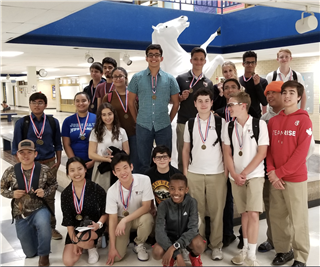 On Saturday, February 24, 28 TMI Spanish language students competed in the local AATSP Spanish Competition held at Longfellow Middle School; over half of our participants brought home awards! 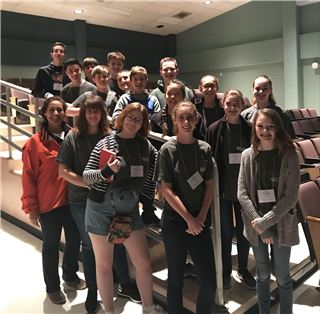 On Saturday, February 24, 2018, students from TMI Episcopal competed in the Texas State Junior Classical League Area B Convention that took place at Reagan High School. TMI Episcopal’s Howell field is the winner of a Fields of Excellence Award from Pioneer Athletics, a Cleveland, Ohio-based manufacturer of field equipment. 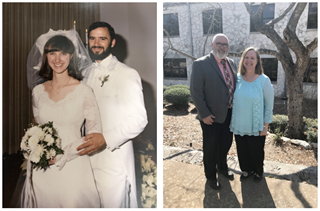 Kate and Rick Faulk, both teachers at TMI Episcopal, renewed their marriage vows Feb. 14 in the school’s All Saints Chapel. 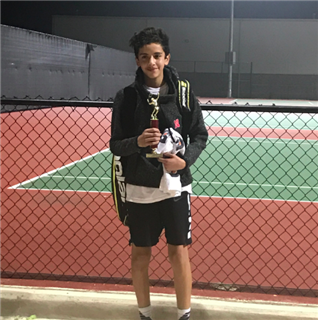 Congratulations to freshman Christian Cuellar on winning first place in the varsity boys singles division at the Floresville Varsity Tennis Invitational. 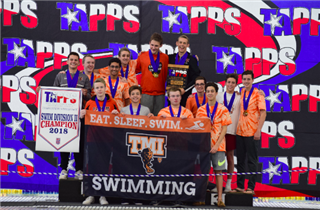 The TMI Episcopal boys varsity swim team won first place out of 19 schools competing at the TAPPS Division II Championships, held Feb. 8 in Mansfield. 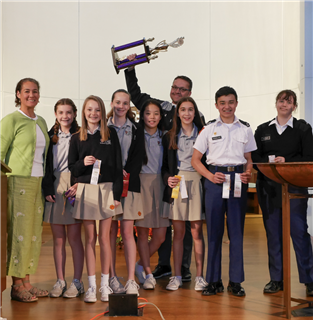 Latin students from TMI Episcopal brought home a win from Baylor Latin Day. Congratulations to the following students who received Gold, Silver, and Bronze President's Volunteer Service Awards for 2017. 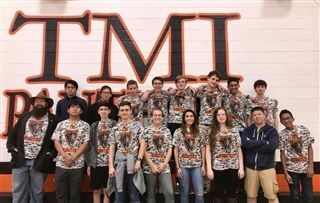 Congratulations to our TMI Robotics teams! 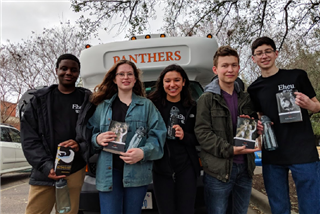 Team #6221 took 1st place out of 18 schools at the Hill Country League Championship this past Saturday as well as won the judge’s Motivate Award. Read how one English teacher is using Google Classroom to connect with her students when it fits into their schedules. 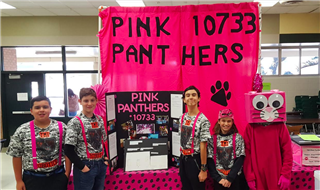 Congratulations to the TMI Pink Panthers, who won the Core Values 1st Place trophy at their FIRST LEGO League (FLL) qualifying tournament on Saturday, January 13, at Sul Ross Middle School. 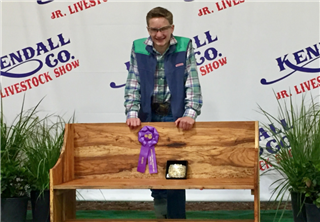 Congratulations to 8th grader Hayden Dietrich on winning Grand Champion for his Ag Mechanics project at the 2018 Kendall County Junior Livestock Show for his Spalted Pecan wooden bench. TMI’s football team answered the call and went the extra mile on Tuesday morning, December 19, to bring Christmas joy to 5-year-old Ryland Ward, one of the youngest survivors of the Sutherland Springs church shooting last month. From taking the wrong bus and ending up lost in a foreign city to facing the impending moment of finding a spit-roasted guinea pig on her dinner plate, JuliaGrace Walker ’17 eloquently describes how her life at TMI prepared her for a year abroad. 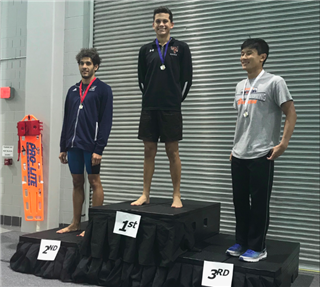 Victor Alejos, Jessica Cox, and Robby Devlin represented TMI at the 2017 TISCA Swimming & Diving Championships hosted in San Antonio this past weekend. 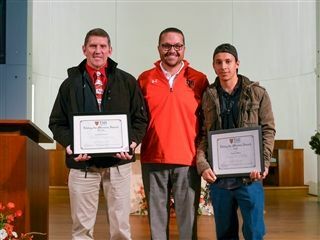 Congratulations to this quarter's Living the Mission award recipients: science teacher Leland Goertz and Maintenance HVAC Technician Daniel Mesa. Congratulations to our TMI Robotics Team 6221 on taking 1st place at the meet, hosted at TMI, this weekend! 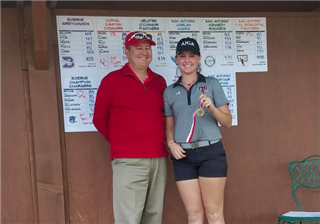 Congratulations to sophomore Delaney Martin on finishing 2nd of 112, with a score of 77 at the Clark High School Christmas Tournament. 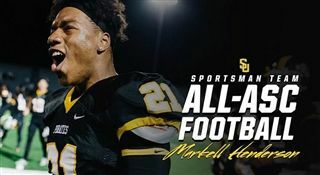 Congratulations to Southwestern University junior running back, Markell Henderson, TMI Class of 2015, on being named to the All-ASC Sportsman Team. 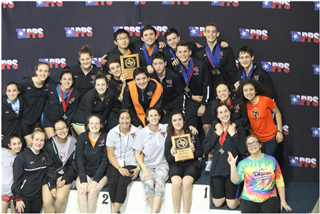 Congratulations to the TMI varsity swimmers at the CCA Private School Invitational this past weekend. 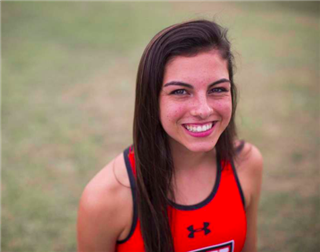 TMI senior Ana Ross won the girls Class 5A individual championship after covering the two-mile course in 12:08.1 on Monday at the Cottonwood Creek Golf Course in Waco. 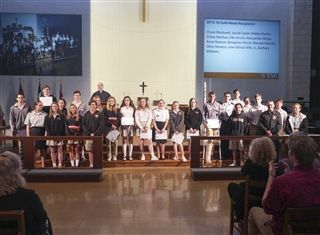 The National Honor Society and National Junior Honor Society chapters of TMI – The Episcopal School of Texas inducted new members Oct. 25 in the school’s All Saints Chapel. 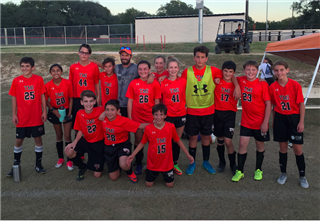 Congratulations to the Middle School A Soccer Team on winning the ISAL championship. Congratulations to freshman Hanna Olaussen and her horse, Wearin Only Moonlite ("Moonshine”), on becoming the congress champions in western riding. 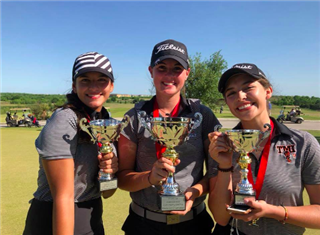 TMI sophomore Delaney Martin won the San Antonio Independent School District Girls Golf Tournament, held Friday at Northern Hills Golf Club. 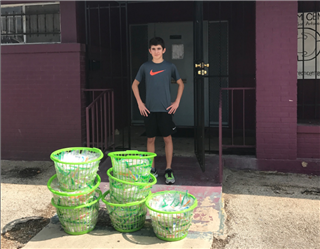 TMI eighth grader, Marco Bonilla, put together 1,000 shower bags to donate to the Thrive Outreach Center for struggling/homeless families. Congratulations to TMI's August/September Middle School Servant Leaders of the Month: Isaac Rupe, 6th grade; Olivia Talley, 7th grade; and Weston Peters, 8th grade. 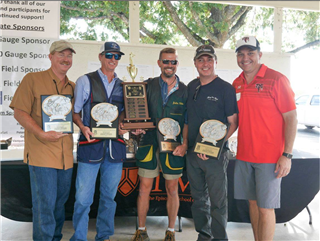 The TMI Alumni Association set a fundraising record at its 17th Annual Modified Sporting Clay Shoot, held Sept. 8 at the San Antonio Gun Club. 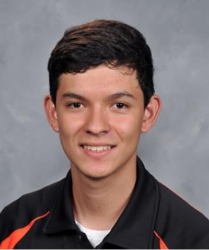 Alex Homma, a senior at TMI – The Episcopal School of Texas, earned the highest possible score on the ACT college readiness test. 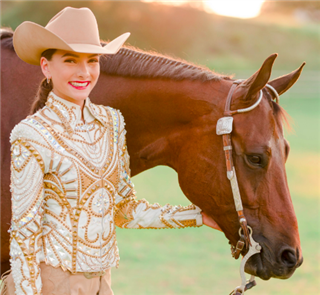 Congratulations to freshman Hanna Olaussen and her horse Wearin Only Moonlite ("Moonshine") on winning Horsemanship Level 2 and bronze awards in Western Pleasure Level 2 and Western Pleasure Level 3 at the AQHA Youth World Championship in Oklahoma City earlier this month. 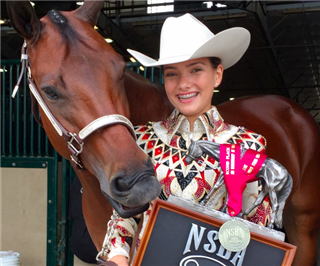 At the NSBA World Show in Tulsa they were reserve world champions in NY Showmanship and bronze winners in Youth Horsemanship. 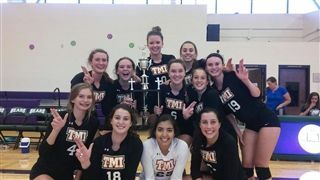 Congratulations to the varsity volleyball team on bringing home the championship win from the Hill Country Classic Tournament this past weekend; Go Panthers! 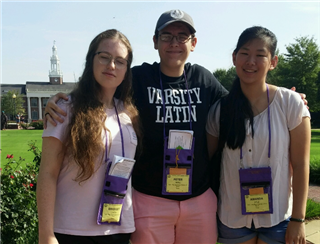 Three students from TMI – The Episcopal School of Texas earned top places in competitions at the National Junior Classical League convention, held July 23-29 at Troy University in Troy, Ala.
Jill Cross, Dean of Curriculum and Instruction at TMI - The Episcopal School of Texas, has been invited to become an Influence Leader for the Association for Supervision and Curriculum Development (ASCD), a nonprofit organization that supports professional learning for educators. 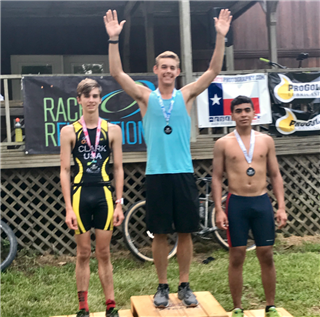 Rising senior Robby Devlin places first in the under 35 category at the XTERRA Magnolia Hill Off-Road Triathlon. TMI – The Episcopal School of Texas has announced its first Hall of Fame nominees for the 2017-2018 school year. Alumni, former faculty and other friends of TMI are recognized within one of the Four Pillars of a TMI education: Academics, Athletics, Military and Spirituality. 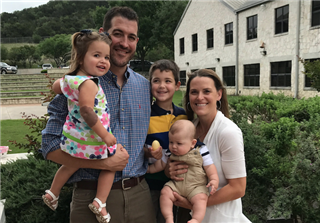 TMI – The Episcopal School of Texas has named Ryan Kohnen, a 1998 graduate, as chief advancement officer. His responsibilities will include leading and overseeing all aspects of TMI's advancement program, which includes annual giving and special events, alumni relations, endowed gifts, planned giving and capital campaigns. 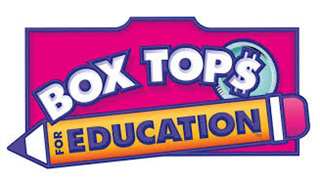 The Family Association is holding a contest to see which student can collect the most Box Tops during the summer months! 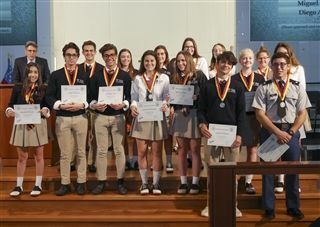 Students were recognized for their achievements in the National Latin Exam and by the National Latin Honor Society at the end-of-year awards ceremony. 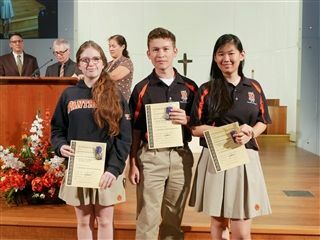 Students were recognized for their achievements on the National Spanish Exam at the end-of-year awards ceremony. 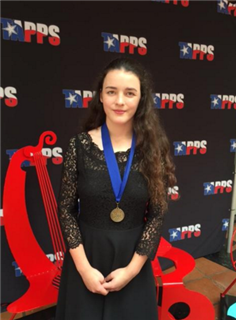 Jordan Bell, a sophomore at TMI – The Episcopal School of Texas, earned a Superior rating and a gold medal at the TAPPS String Championship, held March 29 at St. Mary’s University. 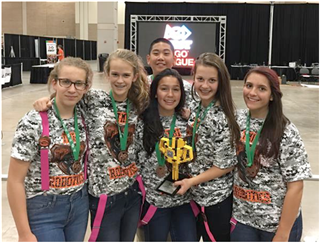 Two robotics teams from TMI – The Episcopal School of Texas claimed awards at the Alamo FIRST LEGO League (FLL) Championship – West, held March 12 at Metzger Middle School. 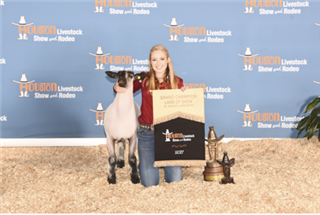 Cameron Crenwelge, a senior at TMI – The Episcopal School of Texas, claimed Grand Champion Market Junior Lamb on March 17 at the Houston Livestock Show and Rodeo. 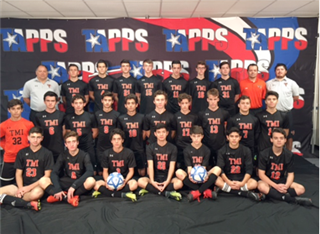 Members of the boys varsity soccer team from TMI – The Episcopal School of Texas – 2017 champions of the Texas Association of Private and Parochial Schools (TAPPS), Division II – were named to TAPPS all-state honor teams for the winter season. 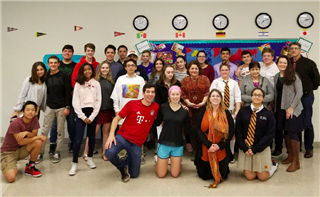 Students from TMI – The Episcopal School of Texas brought home awards from ¡Colores, Voces y Poesía!, a Spanish contest sponsored by the local chapter of the American Association of Teachers of Spanish and Portuguese, held March 4 at the San Antonio Young Women’s Leadership Academy. 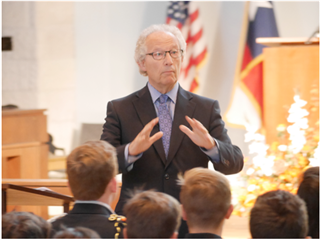 Henry McLeish, former First Minister of Scotland, told students at TMI – The Episcopal School of Texas that winning isn’t everything. 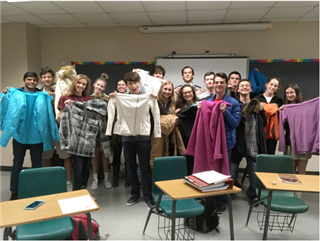 Students in TMI's chapter of the National Honor Society (NHS) collected gently used winter coats from the school community to donate to Hill Country Family Services, a Boerne-based aid agency that provides food and clothing assistance to needy families. 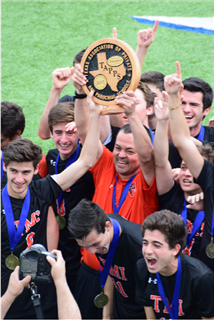 The boys varsity soccer team of TMI – The Episcopal School of Texas won the Texas Association of Private and Parochial Schools (TAPPS) Division II championship 3-1 over defending champions Grapevine Faith Christian School on March 8 at Waco ISD Stadium. 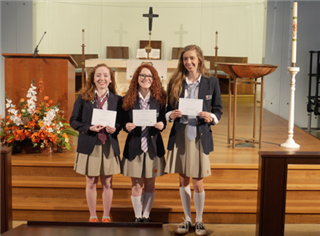 Three seniors at TMI – The Episcopal School of Texas have been named finalists in the 2017 National Merit Scholarship competition. 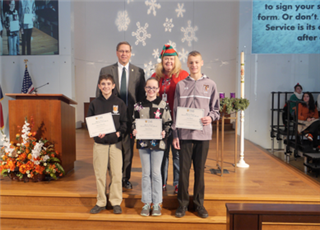 TMI students were honored in chapel on Monday, March 6, for earning bronze, silver, and gold Presidential Volunteer Service Awards for their service hours earned during the 2014-2015 and 2015-2016 school years. Congratulations to the 15 TMI students who competed in the local Spanish contest, ¡Colores, Voces y Poesía!, sponsored by the local chapter of the American Association of Teachers of Spanish and Portuguese, held at the Young Women's Leadership Academy. 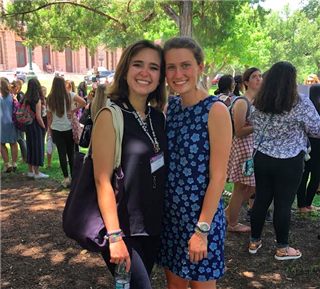 Hailey Carter, a 2015 graduate of TMI – The Episcopal School of Texas, was named February Student Leader of the Month at the University of Arkansas in Fayetteville, Ark. 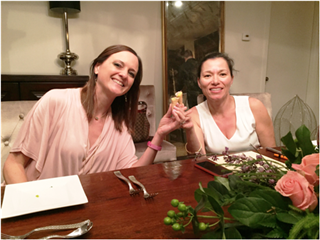 The annual gala of TMI – The Episcopal School of Texas will have a tropical flair. Stars 2017: Havana Nights will feature a menu inspired by Cuban cuisine, prepared by Rosemary’s Catering. 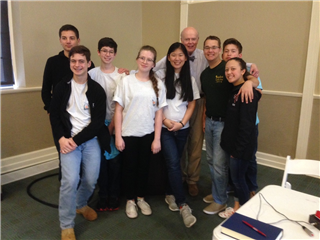 Students from TMI – The Episcopal School of Texas competed successfully at the annual Area B Junior Classical League Convention held Feb. 18 at Earl Warren High School. 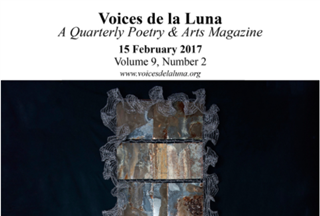 TMI students are featured in the Feb. 15, 2017, issue of Voices de la Luna: A Quarterly Poetry and Arts Magazine. 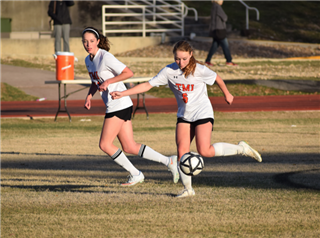 Brooke Smithson, a junior at TMI – The Episcopal School of Texas, scored her 100th career soccer goal Feb. 7 during an away game against Holy Cross High School. 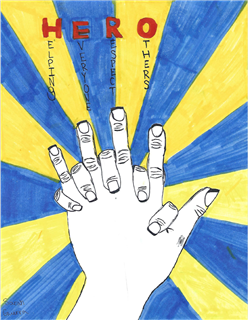 Congratulations to TMI HERO poster contest winner, Sarah Guerra (7th grade); poster design below. 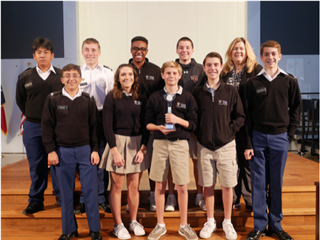 Students of Latin from TMI – The Episcopal School of Texas won firsts in two classics competitions held Feb. 17 at Baylor University in Waco. The boys varsity soccer team of TMI – The Episcopal School of Texas won its fourth consecutive Texas Association of Private and Parochial Schools (TAPPS) Division 2, District 5 championship Feb. 17 with a 3-2 win at Saint Mary’s Hall. 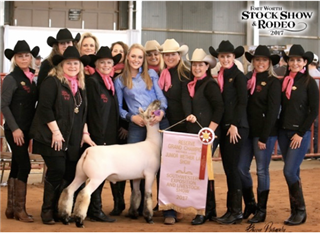 Cameron Crenwelge, a senior at TMI – The Episcopal School of Texas, won Reserve Champion overall with her Grand Champion Finewool Cross lamb Feb. 4 at the Junior Sale of Champions at the Fort Worth Stock Show and Rodeo. 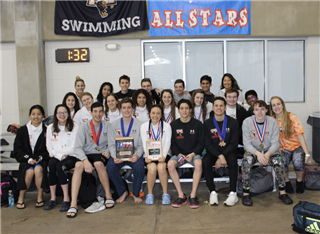 Varsity swimmers from TMI – The Episcopal School of Texas brought home gold and silver medals and took second overall at the Texas Association of Private and Parochial Schools (TAPPS) Division II State Championships, held Feb. 10 in the Josh Davis Natatorium at Blossom Athletic Center. 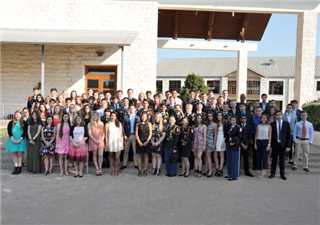 The 52nd annual Military Ball of TMI – The Episcopal School of Texas, held Feb. 4 at the Hyatt Regency Hill Country Resort, broke a school record for attendance at the formal event celebrating the school’s Corps of Cadets (JROTC). 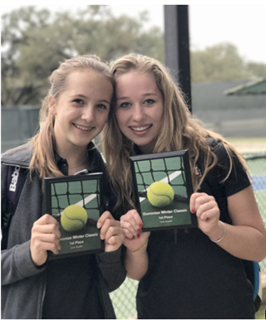 Promising young student-athletes from TMI – The Episcopal School of Texas took top places at the Dominion Freshman/JV Invitational tournament, held Feb. 2 at the Club at the Dominion. 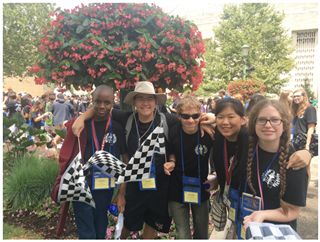 A second middle-school robotics team from TMI – The Episcopal School of Texas has won first place in its qualifying tournament in the FIRST LEGO League (FLL) competition. The TMI Pink Panthers team won the Champions Award at their qualifying tournament, held Feb. 4 at Briscoe Middle School. 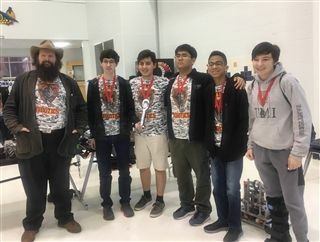 The previous week, another TMI robotics team, the Rowdy Robots, won the same honor at their tournament in Fredericksburg. 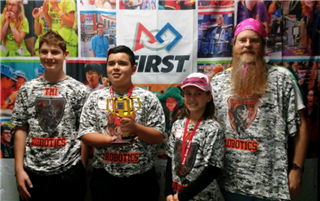 The Rowdy Robots team from TMI – The Episcopal School of Texas won the first-place Championship Award at the FLL (FIRST Lego League) Robotics Tournament held Jan. 21 at Fredericksburg Elementary School in Fredericksburg. 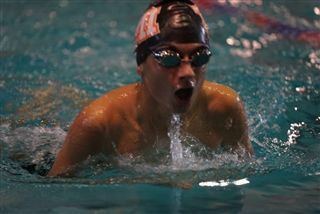 The meet drew teams from other Gillespie County schools as well as from Bandera and San Antonio. 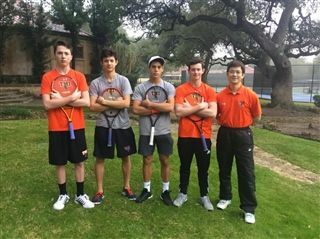 Four senior boys on the varsity tennis team of TMI – The Episcopal School of Texas won their way to the last day of the Dominion Winter Classic tournament, held Jan. 19-21 at the Dominion Country Club. 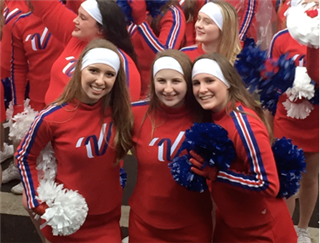 TMI varsity cheerleaders Caroline Peterson and Brittany Schur of Boerne participated Jan. 1 in London’s New Year’s Day Parade (LNYDP). By invitation from the Universal Cheerleaders Association (UCA), they were among 600 All American Cheerleaders from all over the United States. 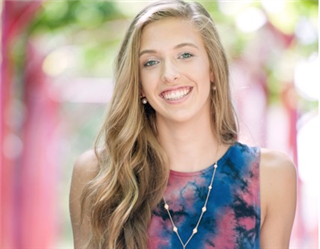 Victoria Flener, a senior at TMI – The Episcopal School of Texas, was one of 74 area students chosen to receive a Valero Alamo Bowl scholarship to the colleges of their choice. The varsity cheer squad from TMI – The Episcopal School of Texas brought home some top awards from the Texas Association of Private and Parochial Schools (TAPPS) state cheerleading competition, held Dec. 8-9 in the Arlington Convention Center in Arlington. 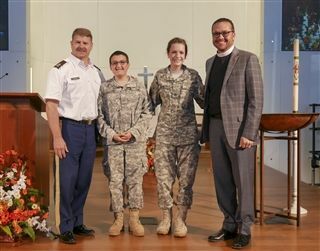 Two members of the Texas Military Institute Corps of Cadets received Cadet of the Month honors Dec. 6 during daily chapel at TMI – The Episcopal School of Texas. 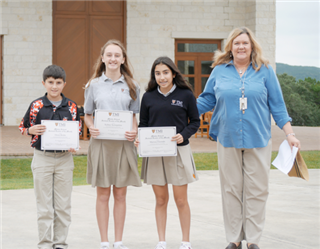 Three students at TMI – The Episcopal School of Texas were recognized as November’s Middle School Servant Leaders of the Month on Dec. 9 during daily chapel in the school’s All Saints Chapel. 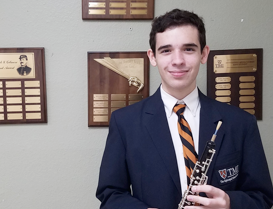 Ethan Arellano, a junior at TMI – The Episcopal School of Texas, was chosen for the Texas Music Educators Association (TMEA) District and Region Band. 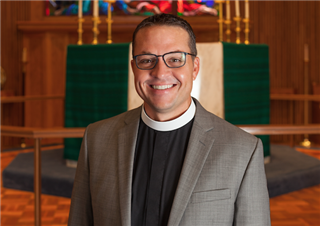 TMI’s Board of Governors is delighted to announce that The Rev. Scott Brown has been called to be the next Headmaster of TMI – The Episcopal School of Texas. Brown, 41, is well known to many in the community, having served as Chaplain of TMI from 2004-2007. Cameron Crenwelge, a senior at TMI – The Episcopal School of Texas, signed Nov. 9 to ride for the No. 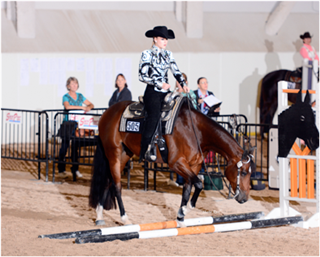 1-ranked equestrian team at Texas A&M University next year. 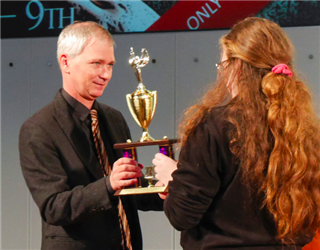 Elizabeth Holmes, a senior at TMI – The Episcopal School of Texas, won first place in the school’s fifth annual Poetry Out Loud recitation contest, held Nov. 28 in the school’s Margaret M. Alkek Theater. Runner-up was sophomore Bridget Lynch. 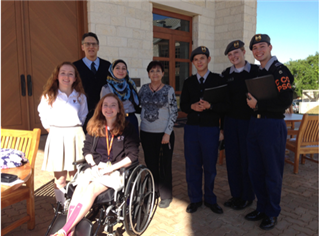 TMI – The Episcopal School of Texas welcomed more than 150 grandparents and “grandfriends” (surrogate grandparents) of students to campus for its Nov. 16 Grandparents and Grandfriends Day. 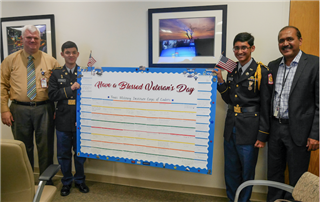 Members of the Texas Military Institute Corps of Cadets at TMI – The Episcopal School of Texas brought good wishes for Veterans Day to the Audie L. Murphy Memorial VA Hospital. 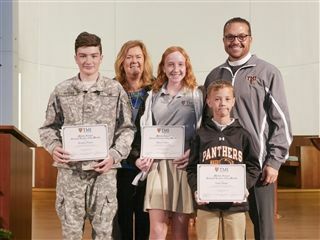 Three students at TMI – The Episcopal School of Texas were recognized as October’s Middle School Servant Leaders of the Month during daily chapel in the school’s All Saints Chapel. 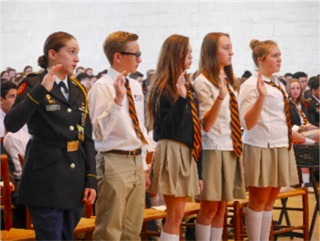 Chapters of the National Honor Society (NHS) and National Junior Honor Society (NJHS) at TMI this season inducted new members during an Oct. 26 ceremony in All Saints Chapel. 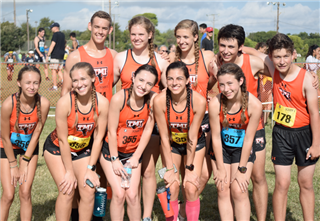 The girls varsity cross-country team from TMI won first place at the TAPPS District 5A cross-country meet, held Oct. 22 at TMI, and boys varsity took second place. Senior Curtis Small was selected to play in the 2017 San Antonio Sports All-Star Football Game presented by H-E-B. Small, a wide receiver and defensive back, was chosen as one of the area’s most outstanding high-school football players, who will participate in the annual game Jan. 7 in the Alamodome, following the U.S. Army All-American Bowl. 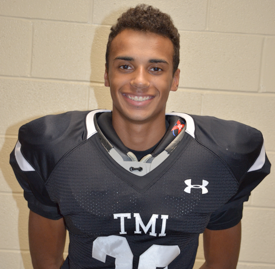 He will play on the West team, for players representing schools west of U.S. Highway 281. 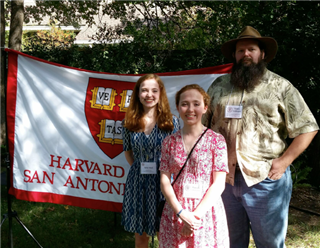 Hannah Wool, a senior at TMI, was among area students recognized Oct. 23 at a Harvard Club of San Antonio barbecue in honor of 2016 student and faculty Harvard Prize Book recipients. TMI math teacher Travis Waddington, Ph.D., also was honored as a faculty recipient. 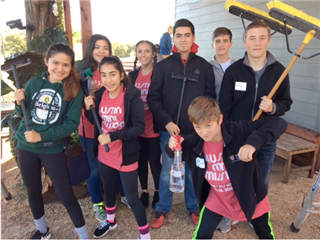 Middle-school students from TMI spent a weekend in service Oct. 21-23 at Austin’s Community First Village, a program that aims to provide permanent housing for the chronically homeless in a tiny-home and mobile-home community on the city’s East Side. 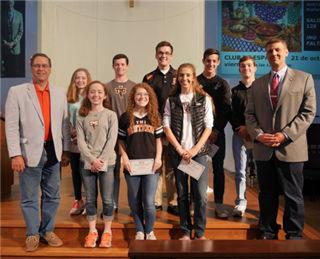 Eight seniors at TMI were honored for their academic accomplishments by national recognition programs Oct. 21 during daily chapel. 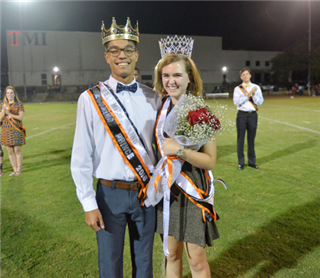 Jeremy Clark and Ana Paula Velasco, seniors at TMI, were crowned Homecoming King and Queen on Oct. 15 during halftime at the school’s Homecoming football game against St. Joseph High School of Victoria. 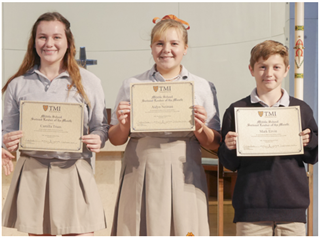 Three students at TMI – The Episcopal School of Texas were recognized as September’s Middle School Servant Leaders of the Month on Oct. 7 during daily chapel in the school’s All Saints Chapel. 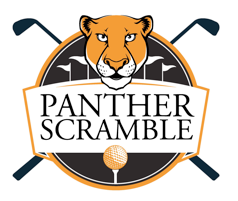 TMI – The Episcopal School of Texas will hold its Panther Scramble golf tournament Monday, Oct. 24, at the Resort Course at La Cantera, recently renovated and known for its challenging scenic vistas. If all goes well, someday TMI – The Episcopal School of Texas will have more bats than students. 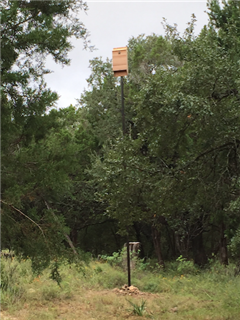 The school put up two new bat houses Sept. 26 with hopes that this addition to the campus will lead to natural pest control and other benefits. 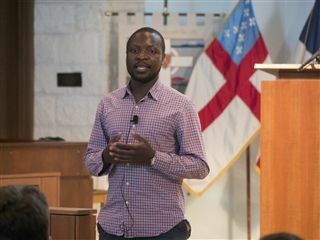 TMI – The Episcopal School of Texas welcomed William Kamkwamba, author of an autobiography, “The Boy Who Harnessed the Wind,” spoke Sept. 23 to the student body during daily chapel. 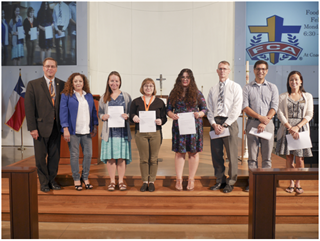 The Family Association of TMI – The Episcopal School of Texas presented grants for new teachers or those teaching new courses Sept. 12 during daily chapel. 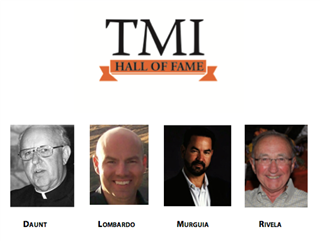 TMI – The Episcopal School of Texas has announced its first Hall of Fame nominees for the 2016-2017 school year. Alumni, former faculty and other friends of TMI are recognized within one of the Four Pillars of a TMI education: Academics, Athletics, Military and Spirituality. 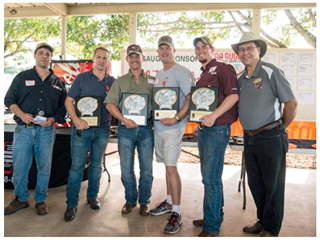 The TMI Alumni Association will hold its 16th Annual Modified Sporting Clay Shoot on Sept. 9 at the San Antonio Gun Club. 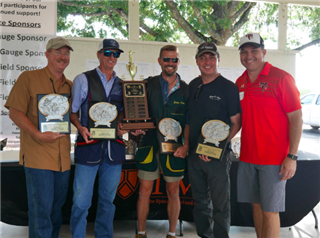 The event has raised more than $50,000 for the TMI Alumni Association Endowed Scholarship, a merit award that has been given out for the past three years. 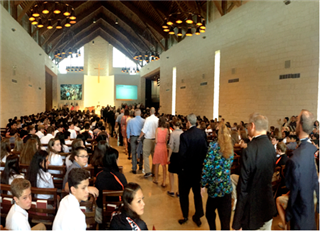 TMI – The Episcopal School of Texas started the 2016-2017 school year Aug. 17 with its annual tradition of a university-style Convocation followed by “the Greeting,” where all faculty and staff line up to welcome all students on the first day of school. 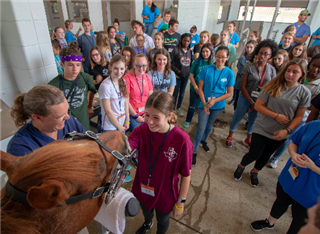 In its fourth year, Summer at TMI – the school's seven-week summer program – broke previous records with an enrollment of 1,010 in classes and camps for ages four through 18. The program offered 27 camps as well as academic courses. 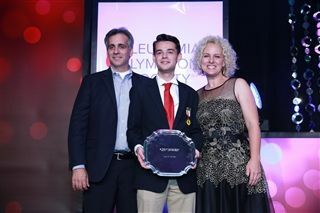 Rising senior, Chad Harthan, raised over $290,000 to become The Leukemia & Lymphoma Society’s “Man of the Year”. A leukemia survivor himself, Chad has been in remission for 15 years now. 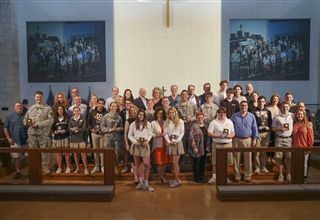 The class of 2016 at TMI – The Episcopal School of Texas graduated May 26 in the school’s All Saints Chapel. The 81 graduates were offered $9.5 million in scholarships as well as admission to colleges and universities including Auburn, Baylor, Boston College, Boston University, Cal Tech, Case Western Reserve, Clemson, Colgate, Dartmouth, Davidson, Duke, Emory, Fordham, Georgetown, Johns Hopkins, LSU, MIT, NYU, Ohio State, Parsons School of Design, Penn State, Purdue, Rensselaer Polytechnic Institute, Rice, Rutgers, Sewanee (University of the South), Texas A&M, Tulane, U.S. Air Force Academy, University of Colorado at Boulder, University of Michigan, University of St. Andrews (Scotland), UT-Austin, University of Virginia, Vanderbilt, VMI, Washington University in St. Louis, and West Point. 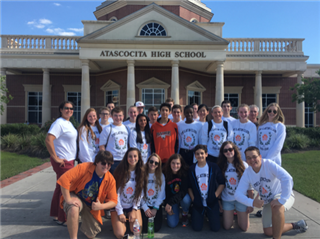 Latin students earned top honors at the Texas State Junior Classical League (JCL) Convention, held April 22-23 at Atascocita High School in Humble. 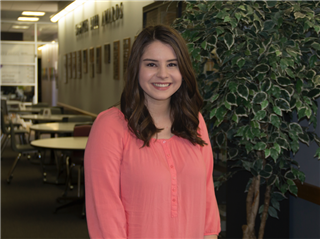 TMI students won the overall first-place award at the first-ever Texas Lutheran University Spanish contest, held April 2 in the Schuech Fine Arts Center at Texas Lutheran University in Seguin. 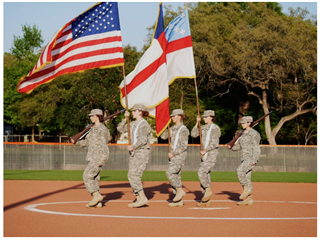 TMI – The Episcopal School of Texas held a grand-opening ceremony March 22 for its new softball complex, which includes a new field, batting cages and a concession stand. 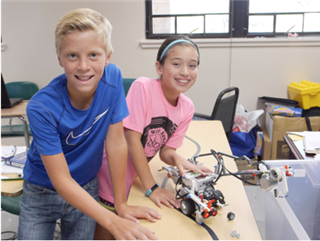 A robotics team from TMI – The Episcopal School of Texas qualified to attend the FIRST LEGO (FLL) League World Championship, to be held April 27-30 in St. Louis. 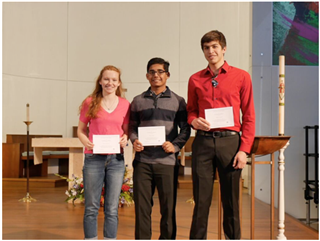 Three seniors from TMI – The Episcopal School of Texas have been named finalists in the National Merit Scholarship competition. 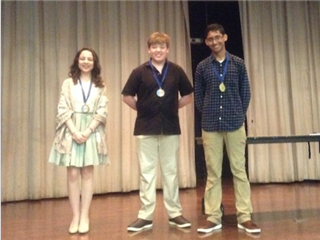 Hector Castillo, Saad Ehsan and Grace Westerman are now eligible for merit awards, to be announced in March. 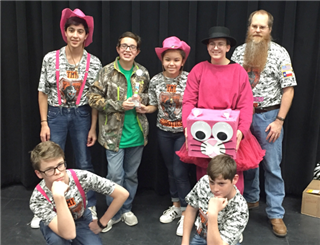 TMI's Pink Panthers robotics team won a first-place award at the FIRST LEGO League (FLL) Alamo Regional Qualifier, held Jan. 23 at Lutheran High School.